In developing countries, a high proportion of patients with oral cancer are from lower socioeconomic classes. This high proportion is clearly associated with difficulties in accessing the health care system, with most cases eventually diagnosed at advanced clinical stages. Consequently, more aggressive, multimodal, time consuming and costly staging workups and treatments are needed to treat these patients. The risk of complications, sequelae and disabilities is also increased. Epidemiological data indicate that ethnic and racial groups differ significantly in terms of cancer incidence and mortality. The variations in the incidence and mortality rates among the ethnic and racial groups were due to the differences in the demographic, socio-educational and occupational factors or due to food and tobacco consumption habits. However, there are not many studies about the socio-demographic profile of patients as independent risk for oral cancer in India. Hence, the aim of this study is to assess the socio-demographic profile of oral cancer patients at Tamil Nadu, India. This study was a cross sectional study done at a Cancer hospital in Chennai. The study population were subjects with oral cancer who reported for treatment at the hospital. The sample size consisted of 266 individuals. All oral cancer patients who reported during the month of March, 2011 formed the study group and were included in the study. The subjects who were not willing to participate in the study were excluded. Prior to the start of the study ethical clearance was obtained from the Institutional Ethics Committee of the concerned University. Written informed consent was obtained from the study participants. The procedures followed were in accordance with the Helsinki Declaration of 1975. Prior to the start of the study, permission to conduct the study was obtained from the concerned Cancer hospital in Chennai. A pretested interviewer administered questionnaire was used to assess the socioeconomic status of oral cancer patients. Data collection was scheduled for a period of one month. Socioeconomic status was assessed using Pareek's scale  for rural population and Kuppuswamy's scale  for urban population. The reliability of the scale was found to be very high (r = 0.93). After filling the information, and scoring the individual items, the total score is summed up. This classification uses per capita income derived by calculating total income of all members of the family and dividing it by the number of family members. The income categories are based on the All India Consumer Price Index for industrial workers. The scale is based on three variables- education, occupation and income. A weightage is assigned to each variable according to a seven point pre-defined scale. The total of the three weightages gives the socioeconomic status score which is graded to indicate five classes. Data was entered in Microsoft Excel spreadsheet and analysed using SPSS software (version 15). Chi square test was used to test the statistical significance in difference in prevalence of oral cancer among different occupations and different levels of literacy and it was found to be highly significant (P = 0.000). The study sample consisted of 266 study subjects with oral cancer. Both the rural and urban population were included in the study and it had almost equal representation. [Table 1] shows the distribution of study subjects according to the age groups and gender. Among the study subjects, 181 (68%) were males and 85 (32%) were females. The age group of the study subjects ranged from 20 to 83 years. 31.9% of the males belonged to the 51 - 60 years age group. 33% of the females belonged to the 60 years and above age group. Based on location, 138 (51.87%) study subjects were residing in rural areas and 128 (48.12%) study subjects were residing in urban areas. Based on religion, 212 (79.7%), 35 (13.20%), 19 (7.10%) were Hindus, Christians and Muslims respectively. Based on marital status, 253 (95.10%) were married, 12 (4.50%) were single and 1 (0.40%) study subject was a widow. [Figure 1] shows the distribution of study subjects based on age group and level of literacy residing in rural areas. Among the 138 study subjects, 77 (55.8%) were illiterates and 61 (44.2%) were literates. 18.1% of illiterates belonged to the age groups of 41-50 and 51-60 years. 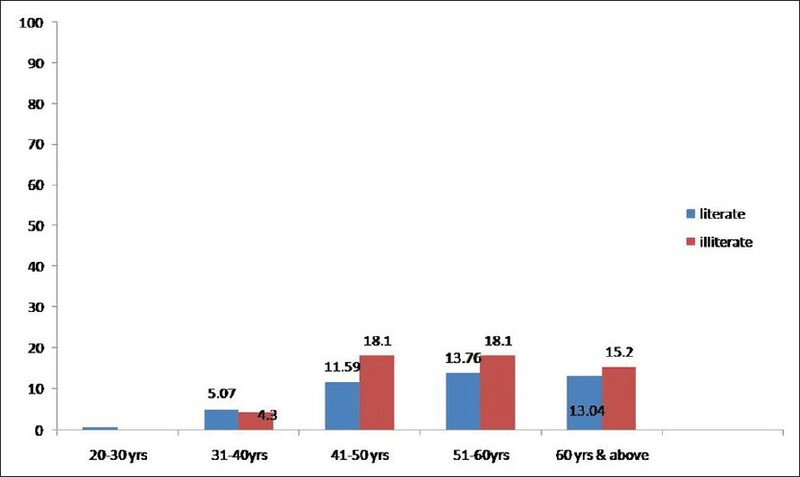 13.76% of literates belonged to the age group of 51-60 years. [Figure 2] shows the distribution of study subjects based on age group and level of literacy residing in urban areas. Among the 128 study subjects, 28 (21.9%) were illiterates and 100 (78.1%) were literates. 9.4% of illiterates belonged to the age group of 51-60 years. 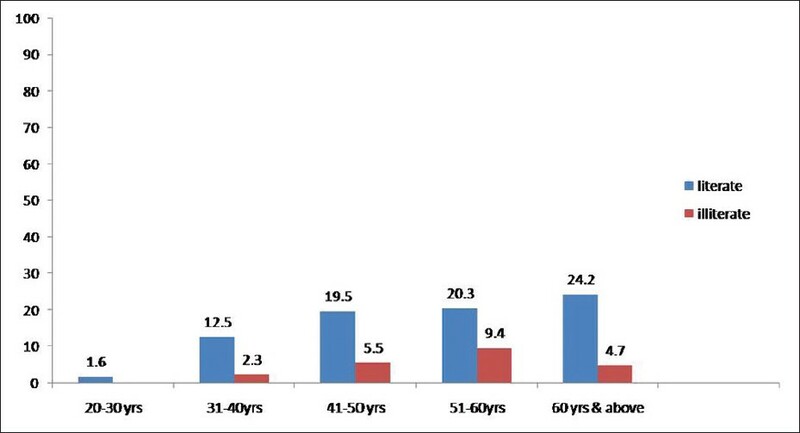 24.2% of literates belonged to the age group of 60 years and above. Among the 138 rural study subjects, unemployed study subjects constituted 40 (28.9%), unskilled workers constituted 23 (16.7%), semiskilled workers constituted 3 (2.22%), skilled workers constituted 2 (1.4%), clerical workers, shopkeepers or farmers constituted 67 (48.5%) and semi-professionals constituted 3 (2.2%). The difference in prevalence of oral cancer among different occupations (Pareek's scale) was found to be significant statistically (P = 0.000). Among the 128 urban study subjects, unemployed study subjects constituted 33 (25.7%), unskilled workers constituted 34 (26.56%), semiskilled workers constituted 7 (5.46%), skilled workers constituted 13 (10.15%), clerical workers, shopkeepers or farmers constituted 24 (18.8%), semi-professionals constituted 8 (6.25%) and professionals constituted 9 (7%). The difference in prevalence of oral cancer among different occupations (Kuppuswamy's scale) was found to be significant statistically (P = 0.000). [Figure 3] shows the distribution of study subjects based on family income and location. Among the 266 study subjects, 131 (94.9%) from rural areas and 92 (71.9%) from urban areas had family income below Rs.5000. The socio economic status based on Pareek's classification in rural areas showed that 68 (49.3%) of the study subjects belonged to the lower class, 57 (41.3%) belonged to the lower middle class, 8 (5.8%) belonged to the middle class and 5 (3.6%) were below poverty line. The socio economic status based on Kuppuswamy's classification in urban areas showed that 67 (52.3%) study subjects belonged to the upper lower class, 25 (19.5%) study subjects belonged to the lower middle class, 15 (11.7%) study subjects belonged to the upper middle class, 12 (9.4%) study subjects belonged to the lower class and 9 (7%) study subjects belonged to the upper class. Given that not many studies of this nature have been conducted formally in the study setting, the present cross sectional study was done to obtain baseline information on the socio demographic profile among the oral cancer patients and to ascertain its validity as a risk factor in the occurrence of oral and pharyngeal cancer. Most of the study subjects belonged to lower middle and upper lower socio economic scale (urban) and to the lower and lower middle class (rural). This was similar to findings of the same study by Khandekar et al. The lower socioeconomic status may be a risk factor for poor oral hygiene thereby further increasing the risk of oral cancer in tobacco consumers. Since tobacco consumption was not considered in this study, further associations cannot be made in this regard. The risk of oral cancer is inversely proportional to increasing level of education, income and occupation. True to this statement, about 48.5% rural subjects had agriculture as a source of occupation and 26.6% urban subjects were unskilled workers. The difference in prevalence of oral cancer among different occupations was found to be significant statistically. In both rural and urban subjects, majority (i.e.) 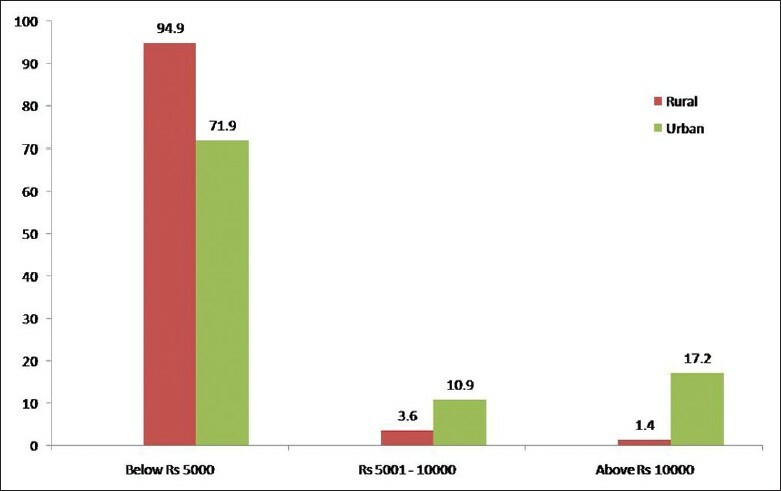 94.9% and 71.9% had family income below Rs.5000. The percentage of illiterates was high both in rural and urban class (i.e.) 55.8% and 21.9% respectively. The difference in prevalence of oral cancer among different levels of literacy was found to be significant statistically. These findings are consistent with similar study conducted by Abdoul et al. in cancer institute at Pune, which concluded low education, occupation and low monthly household income as significant independent risk factors for oral cancer. In terms of religion majority (79.7%) belonged to Hindu religion followed by 13.2% Christians and 7.10% Muslims. While marital status has shown that the category of married was 95.10% and others constituted 4.9%. Similar results in terms of distribution according to religion was found in study by Abdoul et al. It was found that religion and marital status did not show any association with the development of oral cancer independently and neither of them appeared to increase the risk, either in males or females. The limitations of this study includes that tobacco use pattern was not recorded. Cross sectional nature of the study precludes any causal relationship. The education and occupation data were based on self reports. In addition the complexities of obtaining, recording and coding occupational data can lead to misclassification. Data was collected on individual level and not the household level and thus the data on socio economic position may have been incomplete in case of women. Case and control comparisons were not possible. The present data will serve as a part of initial data collection effort. Though the study is hospital based and is representative, it represents only people obtaining treatment during the duration of the study. Moreover, extrapolation of results to the varied general population is not possible in this study. Identifying occupation and education specific disparities in tobacco use can provide useful 'signspot' indicating inequalities that need to be addressed by policy makers and broader community through allocation of resources. We would like to thank our department Bio-statistician, Mr. Jayapal for helping us in statistical analysis of the study. 1. Parkin DM, Bray F, Ferlay J, Pisani P. Estimating the world cancer burden: Globocan 2000. Int J Cancer 2001;94:153-6. 2. Ahluwalia KP. Assessing the oral cancer risk of South - Asian immigrants in New York city. Cancer 2005;104:2959-61. 3. Patel PS, Raval GN, Patel DD, Sainger RN, Shah MH, Shah JS, et al. A study of various socio-demographic factors and plasma vitamin levels in oral and pharyngeal cancer in Gujarat, India. Asian Pac J Cancer Prev 2001;2:215-24. 4. Control of oral cancer in developing countries. A WHO meeting. Bull World Health Organ 1984;62:817-30. 5. Conway DI, Petticrew M, Marlborough H, Berthiller J, Hashibe M, Macpherson LM. Socioeconomic inequalities and oral cancer risk: A systematic review and meta-analysis of case-control studies. Int J Cancer 2008;122:2811-9. 6. Conway DI, Brewster DH, McKinney PA, Stark J, McMahon AD, Macpherson LM. Widening socioeconomic inequalities in oral cancer incidence in Scotland, 1976-2002. Br J Cancer 2007;96:818-20. 7. Edwards DM, Jones J. Incidence of and survival from upper aero digestive tract cancers in the UK: The influence of deprivation. Eur J Cancer 1999;35:968-72. 8. Vartanian JG, Carvalho AL, Toyota J, Kowalski IS, Kowalski LP. Socioeconomic effects of and risk factors for disability in long-term survivors of head and neck cancer. Arch Otolaryngol Head Neck Surg 2006;132:32-5. 9. Steenland K, Hu S, Walker J. All-cause and cause-specific mortality by socioeconomic status among employed persons in 27 US states, 1984-1997. Am J Public Health 2004;94:1037-42. 10. Menvielle G, Luce D, Geoffroy-Perez B, Chastang JF, Leclerc A. Social inequalities and cancer mortality in France 1975-1990. Cancer Causes Control 2005;16:501-13. 11. Madani AH, Dikshit M, Bhaduri D, Jahromi AS, Aghamolaei T. Relationship between selected socio-demographic factors and cancer of oral cavity - a case control study. Cancer Inform 2010;9:163-8. 12. Perera FP. Environment and cancer: Who are susceptible? Science 1997;278:1068-73. 13. Pareek U, Trivedi G. Manual of socio-economic status scale (Rural). New Delhi: Manasayan; 1995. 14. Kuppuswamy B. Manual of socioeconomic status scale (Urban). Delhi: Manasayan; 1981. 15. Khandekar SP, Bagdey PS, Tiwari RR. Oral cancer and some epidemiological factors: A hospital based study. Indian J Community Med 2006;31:157-9. 16. Mehta FS, Gupta MB, Pindborg JJ, Bhonsle RB, Jalnawalla PN, Sinor PN. An intervention study of oral cancer and precancer in rural Indian populations: A preliminary report. Bull World Health Organ 1982;60:441-6. 17. Mathew Iype E, Pandey M, Mathew A, Thomas G, Sebastian P, Krishnan Nair M. Squamous cell carcinoma of the tongue among young Indian adults. Neoplasia 2001;3:273-7. 18. Balaram P, Sridhar H, Rajkumar T, Vaccarella S, Herrero R, Nandakumar A, et al. Oral cancer in southern India: The influence of smoking, drinking, paan chewing and oral hygiene. Int J Cancer 2002;98:440-5.